This time of year is all about coming together and enjoying each other’s company. And that’s exactly what we did last week! 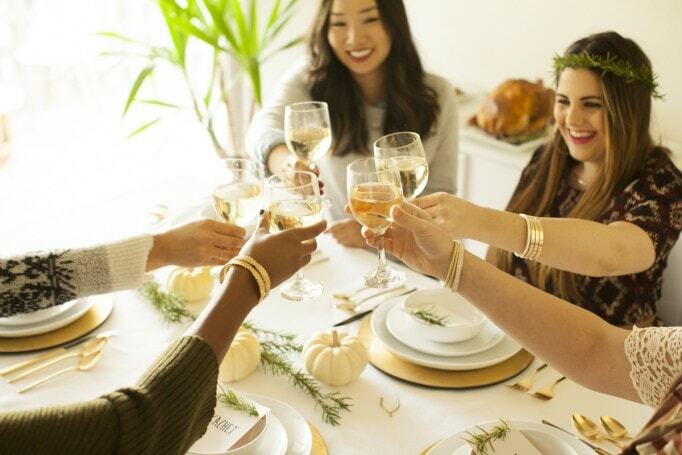 I was absolutely thrilled to invite some of my inspiring, go-getter girlfriends over last week for a chic Friendsgiving soiree. 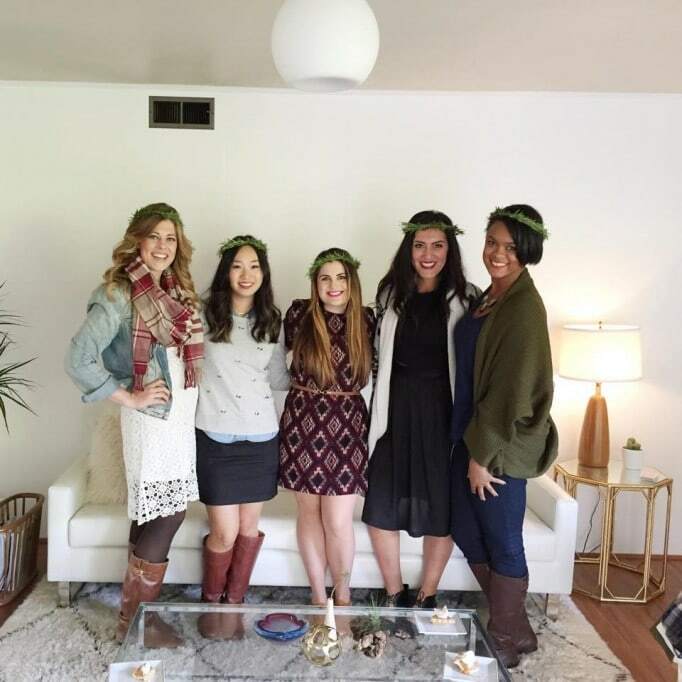 Last week I had Jenny, Maritza, Kachet, and Kyle to my home for an afternoon filled to the brim with fabulous food, great fun, and plenty of laughs. 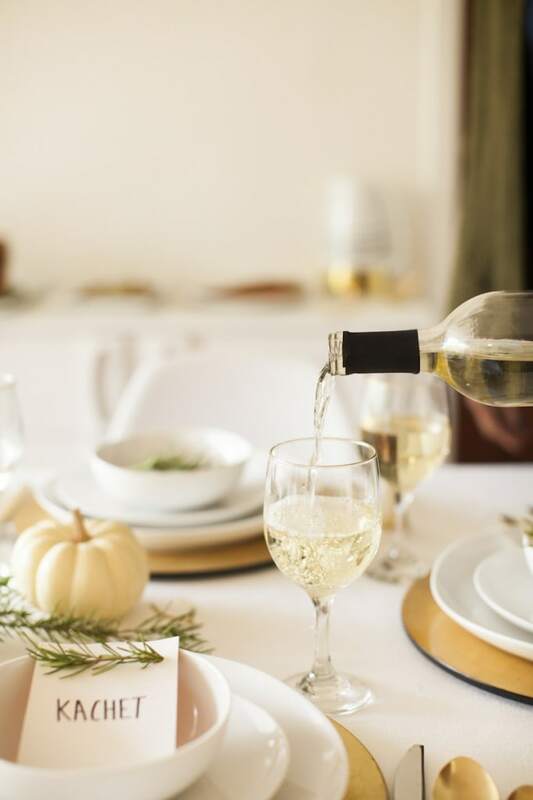 For more fun Friendsgiving inspiration, check out this video. 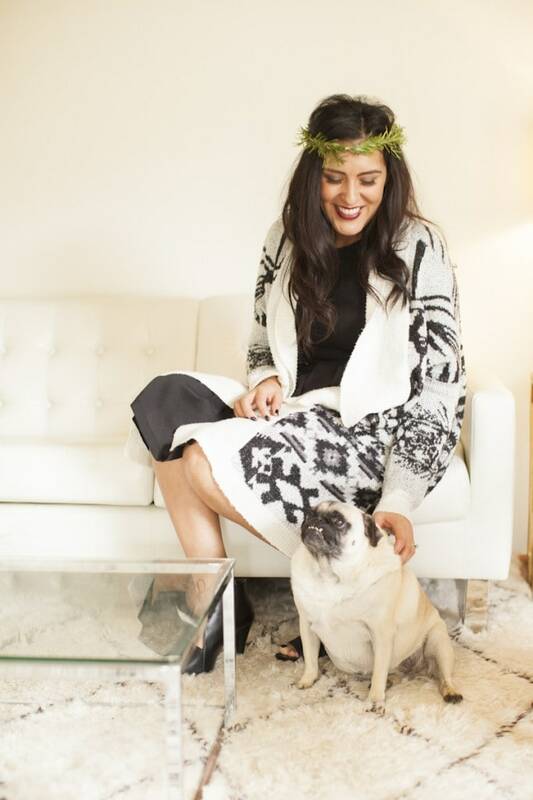 Also check out our post featured on Redbook! 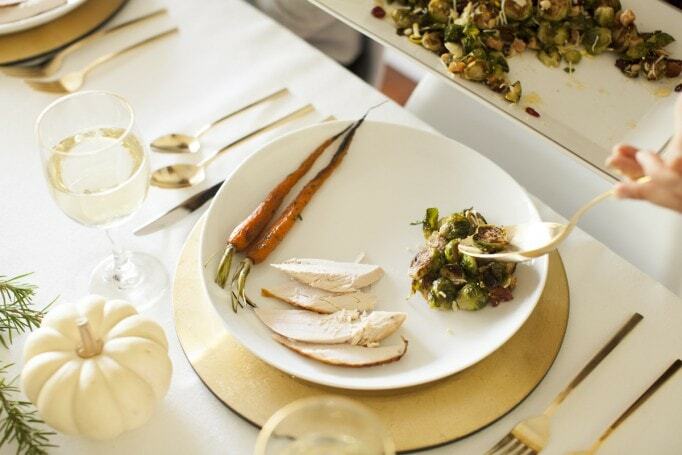 On the menu – We indulged in plenty of roast turkey and roast carrots, and enjoyed a mixture of roasted russet potatoes, sweet potatoes, and purple yams with blue cheese, walnuts, and chives as a side. 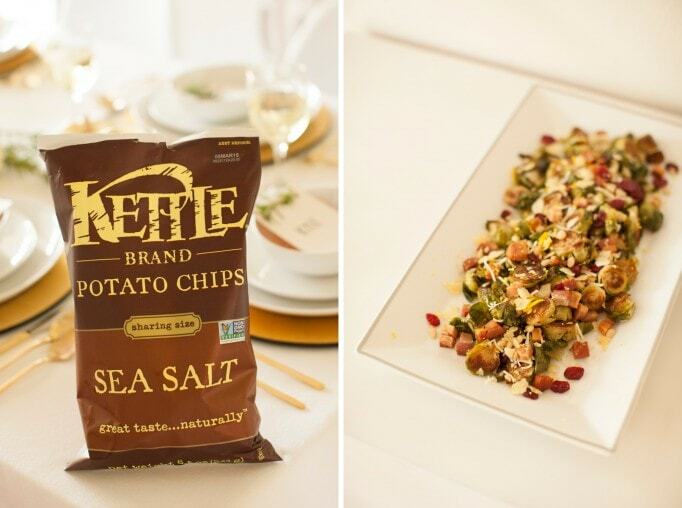 Our other side dish, a combination of brussels sprouts, dried cranberries, bacon, and Kettle Brand Potato Chips was an absolute hit. This was definitely the dish everyone wanted seconds of, so we were sure to include the recipe below. #CantStopWontStop is our new favorite hashtag! 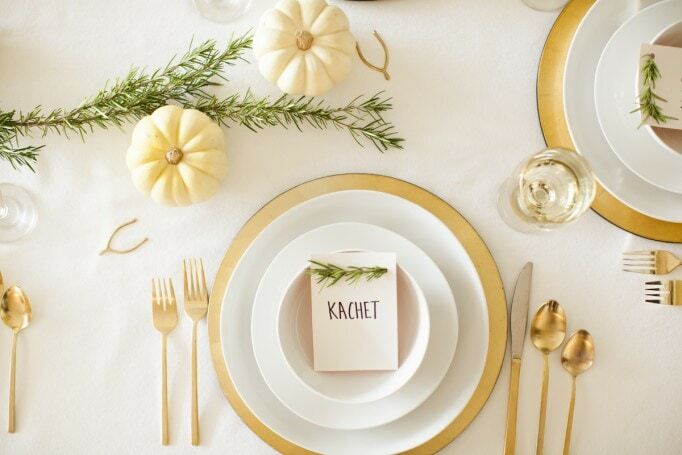 Off to the decor details (my favorite part) – Prior to the guests arriving, I decorated the table with shiny holiday details, including gold silverware, gold place ware, and a gold wishbone at each setting. 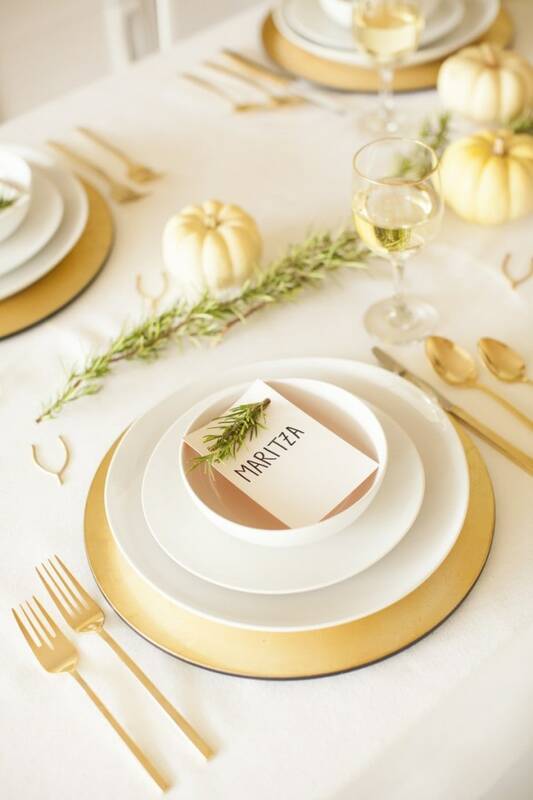 I added white pumpkins to accent the gold details, and balanced the decor with sprigs of rosemary. 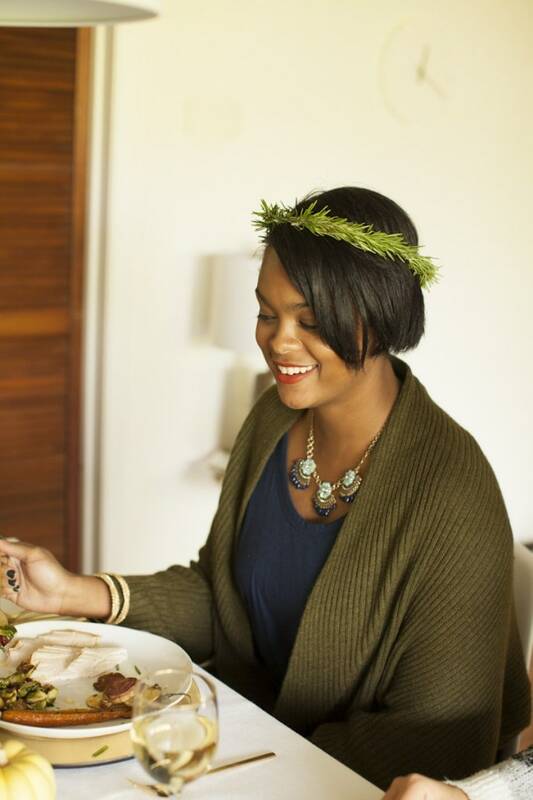 I set the table with handmade rosemary place cards and created DIY rosemary crowns to complete the look. We had an amazing time sharing great stories around the table and enjoying each other’s company. 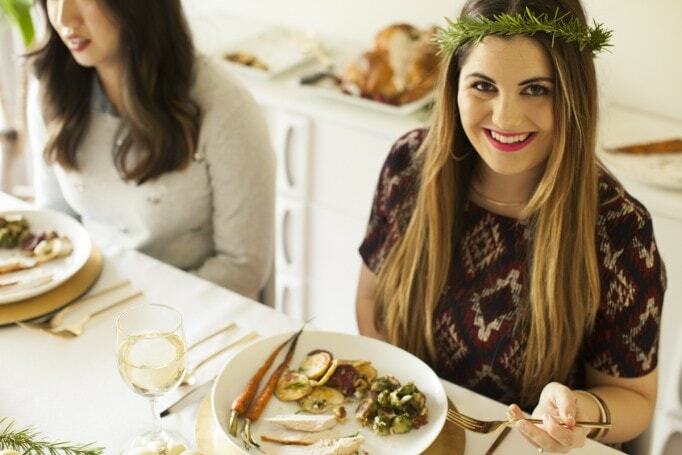 Who would have known how intimate a Friendsgiving feast could be? I’d take this over a coffee date almost any day – as long as it’s after 11:30 AM. 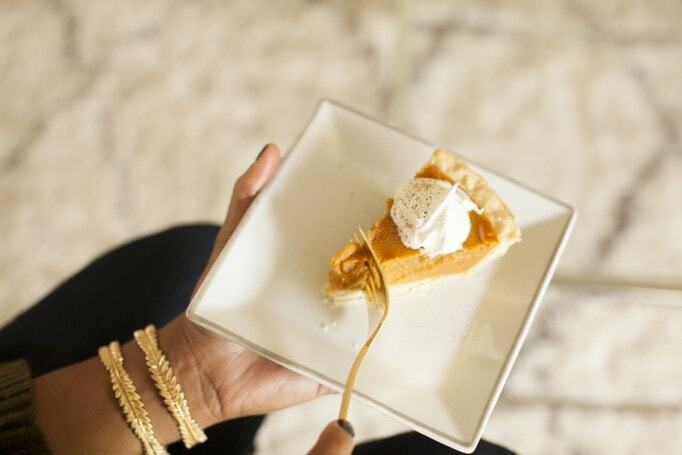 To top it all off, we enjoyed pumpkin pie and sparkling cider. It was so much fun to just sit and catch up, chatting about all of life’s little details! 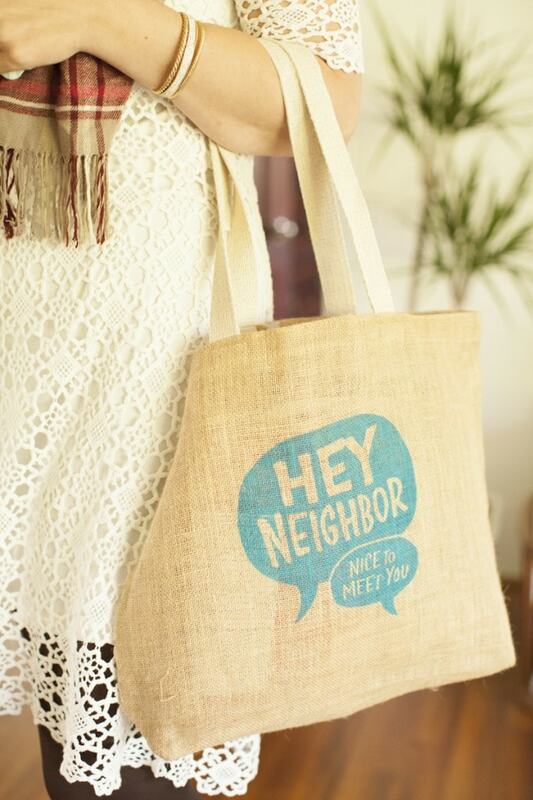 We sent our guests off with these fun burlap ‘Hey Neighbor‘ favor bags from Kettle Brand, packed with Siracha Popcorn and Maple Bacon Popcorn for a sweet snack later on. I am officially obsessed with these!! 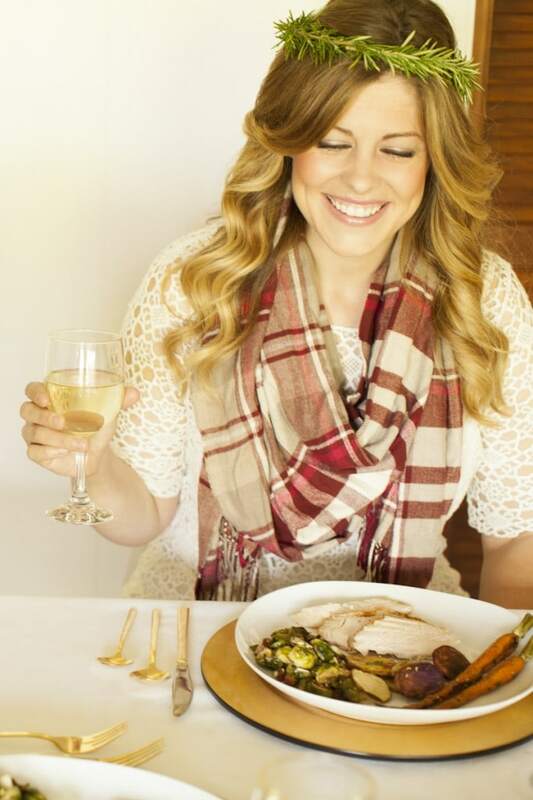 And I am already counting down the days until we can do a Friendsgiving- year #2! I am officially obsessed with this concept! 2. Cook bacon until browned, then finely chop. 3. Toast pine nuts in a pan on medium heat until browned. 4. Toss halved brussels sprouts with olive oil, salt, and pepper in a large bowl, then transfer to a large baking pan. 5. Roast brussels sprouts face down for 25 minutes until caramelized. 6. 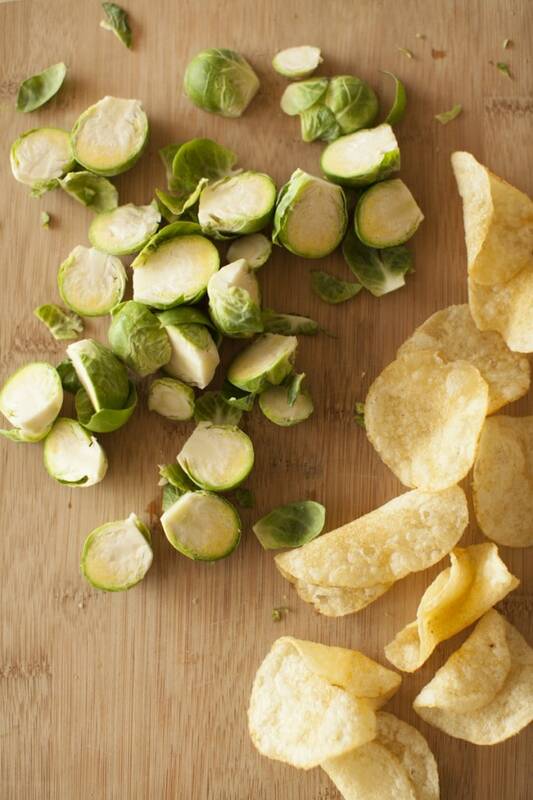 Toss roasted brussels sprouts with dried cranberries, chopped bacon, toasted pine nuts, parmesan, and crumbled Kettle Brand Potato Chips. Serve warm. Honorary Guest: Jenny (Best Friends For Frosting Production Manager), Maritza of Unseen Heroes, Kachet of The Lipstick Giraffe, and Kyle of The Girl Kyle. This post is in partnership with Kettle Brand. Thank you for supporting the sponsors that keep BestFriendsForFrosting.com your go-to guide to creative living! Love the idea!!!! Brussel Sprouts are soooo good for you! 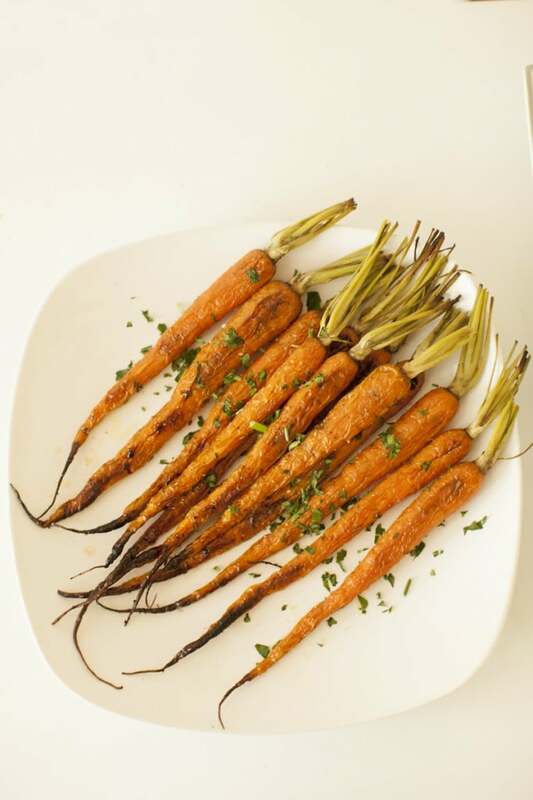 And this is a great way to cook them! 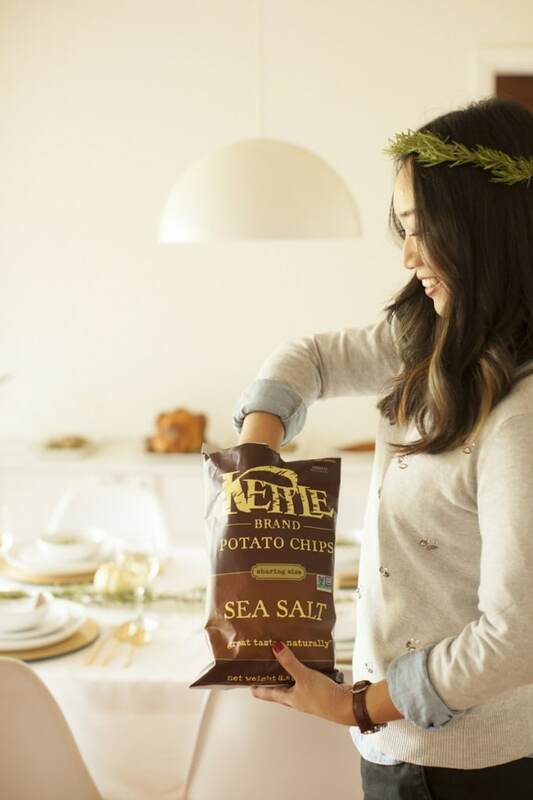 Kettle Chips are my favorite brand, so I can not wait to try and make it. Thank you!